Turkish journalist Ahmet Turan Alkan, in pre-trial detention for 23 months, has lost 30 kilograms during his time behind bars, his lawyer Faruk Zorba said. “Ahmet Turan Alkan has lost 30 kilograms in prison. He did not talk about it but he has medical problems,” Zorba told the court during a hearing on Friday. 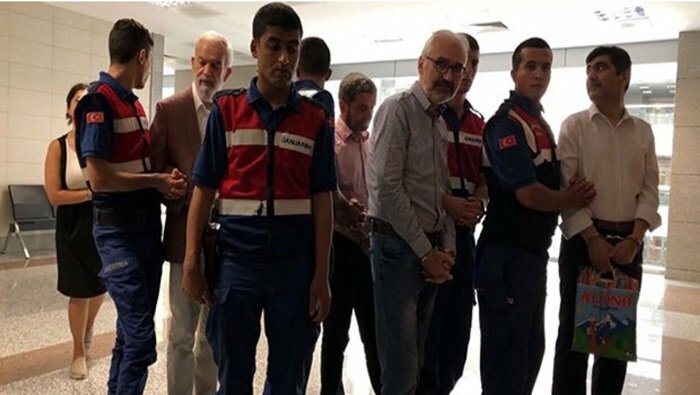 The Istanbul court overseeing his case ruled for a continuation of the pretrial detention of him as well as of 18 other journalists and employees of the Zaman newspaper, shut down by the government in the aftermath of a failed coup attempt on July 15, 2016. Former Zaman writers and editors Mümtaz’er Türköne, Ali Bulaç, Ahmet Metin Sekizkardeş, Ahmet Turan Alkan, Alaattin Güner, Cuma Kaya, Faruk Akkan, Hakan Taşdelen, Hüseyin Belli, Hüseyin Turan, İbrahim Karayeğen, İsmail Küçük, Murat Avcıoğlu, Mustafa Ünal, Onur Kutlu, Sedat Yetişkin, Şeref Yılmaz, Yüksel Durgut and Zafer Özsoy are being tried as part of the trial. The journalists face charges of violating the constitution, membership in a terrorist organization, disseminating the propaganda of a terrorist organization and aiding a terrorist organization. The Zaman daily, which was Turkey’s best-selling newspaper, was closed down along with dozens of other media outlets due to their links to the Gülen movement, which is accused by Turkey’s Justice and Development Party (AK Party) government of masterminding the failed coup attempt in July 2016.